Cherry Jones in the A.R.T. revival. 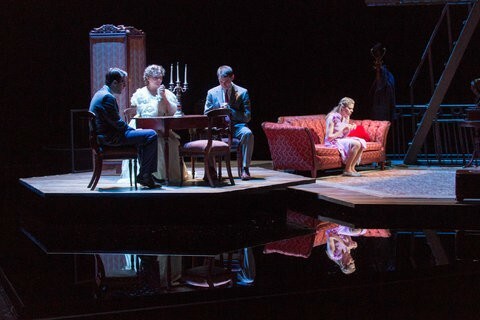 Glass Menagerie transferred from Cambridge to Broadway. Cast: Cherry Jones (Amanda), Zachary Quinto (Tom), Celia Keenan-Bolger (Laura) and Brian J. Smith (the Gentleman Caller). Through Jan. 5. Running time: 2 hours 30 minutes. 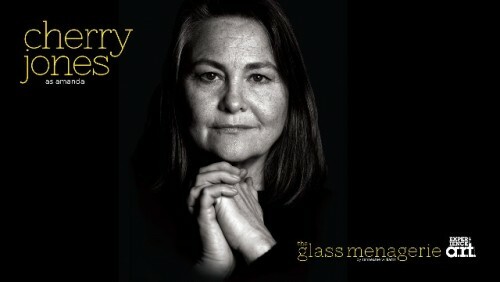 With a definitive Amanda in a benchmark revival of The Glass Menagerie by Tennessee Williams Cherry Jones is likely to be nominated for her third Tony Award. We were utterly enthralled by a powerful and poignant production and superb cast which transferred from American Repertory Theatre, in Cambridge, Mass. to The Booth Theatre on Broadway where it has just closed. The self absorbed and manipulative Amanda, a delusional woman of a certain age, pressures her son Tom (Zachary Quinto) to bring home a Gentleman Caller (Brian J. Smith) arguably to romance and wed her handicapped daughter Laura, played with perfection by Celia Keenan-Bolger. It’s a difficult play requiring delicate balance not to tip into the enervating and maudlin. Here the direction by John Tiffany is masterful as the drama builds and hits its marks. By the end of the play, when hopes and dreams have crashed on stage like Icarus with melted wings, the audience is stunned and shattered. Dragging her bent body about the stage in an entirely credible manner we were captivated by the vulnerability of Laura. We wince at the callous manipulations of Amanda, an over the hill Southern bell, determined to marry her off providing financial security. The small glass figurines Laura collects, particularly the unicorn, are a riveting metaphor for her fragile psyche. Through an accident the Caller turns the unicorn into a horse. It signifies her whimsical fantasies dashed by crushing reality. He has been blind sided into an evening with his colleague’s family. With great restraint he starts to comprehend the setup and dealing with Laura with remarkable tact. With Glass Menagerie A.R.T., under artistic director Diane Paulus, continues to enjoy success bringing Cambridge productions to Broadway. Others include Tony winning musicals Pippin and a version of The Gershwins Porgy and Bess. Insiders felt that All the Way last fall starring Bryan Cranston of Breaking Bad had Broadway potential. Robert Brustein founded A.R.T in 1980 and continued as artistic director until 2002. The experimental, avant-garde mandate continued under Robert Woodruff. We were season subscribers during the Brustein era. The shows were hit and miss. Out of a season of five shows one may be great, one good, a couple were so so and then a real stinker. We gave up after a holiday production of the dreadful Peter Pan and Wendy. We were not alone. More subscribers bailed during Woodruff’s tenure. There was talk of ending A.R.T. as a commercial theatre company and transforming the Loeb Drama Center into a venue for Harvard’s theatre department. The appointment of Paulus in 2008, then a Tony winner for a revival of Hair, was viewed as a travesty. Immediately she sacked the company of actors with considerable rancor. Since then they have appeared with other companies and, with the exception of Will Lebow who burned bridges, have returned for occasional productions. Of course nothing succeeds like success. Paulus has restored theatrical magic to Cambridge setting the tub back on its own bottom. There is zero nostalgia for the good old days. With Paulus as a benchmark we are seeing more regional theatre heading for Broadway. Or from London. This season, ending in mid February, two time and likely third Tony winner, Mark Rylance, imported brilliant British productions of Twelth Night and Richard III. It just doesn't get better. Matilda is rocking New York as did War Horse. We wonder when the incredible production of The Curious Incident of the Dog in the Nighttime will finally cross the pond. Chicago’s Steppenwolf Theatre had a Broadway hit with August: Osage County which has just been released as a film. The Goodman Theatre, after some production obstacles, is sending its sprawling The Iceman Cometh to the Brooklyn Academy of Music before an anticipated transfer to Broadway with Nathan Lane, Brian Dennehy and John Douglas Thompson of Shakespeare & Company heading a superb cast. Before Iceman Thompson will star in the much anticipated Satchmo at the Waldorf by renowned critic Terry Teachout. The co production of Shakespeare & Company and Long Wharf Theatre will open Off Broadway. It’s rare for S&Co. but essential in bringing national attention to its programming. Without that potential hook it’s hard to attract top talent to regional summer theatres. The two person show Women of Will with S&Co. founder, Tina Packer, and Nigel Gore was staged in New York as part of a national tour. Packer has directed Henry VIII currently a hot ticket in Boston. The Williamstown Theatre Festival production of Bridges of Madison County, which was in development last summer, is opening soon on Broadway. In recent interviews Bradley Cooper has indicated that he hopes to bring the WTF production of Elephant Man to Broadway. It’s a matter or raising money and finding a break in his busy film schedule. Word is that last summer’s smash Barrington Stage production of Leonard Bernstein’s On the Town is waiting for a Broadway venue and may load in by Spring. With the January openings not everything will make it and a theatre is likely to become available for a good to go production. Barrington’s William Finn musical Little Miss Sunshine opened this season to less than great reviews. Nothing like his prior 25th Annual Putnam County Spelling Bee. Mark St. Germain’s Barrington one woman show with Debra Jo Rupp Becoming Dr. Ruth is currently enjoying a strong run Off Broadway. Last summer’s Scott and Hem in the Garden of Allah by St. Germain, which co-premiered at Barrington and at Contemporary American Theatre Festival in West Virginia, has continued in regional theatres. This season Barrington will premiere St. Germain’s two person show Dancing Lessons. We would like to know what’s happening with Mary Zimmerman’s Jungle Book which was awesome last fall in a premiere for Huntington Theatre Company. Or Jane Martin’s scorching H2O which was the hit of the Contemporary American Theatre Festival last summer in Shepherdstown. Talking with regional artistic directors they deny a mandate to send shows to New York. OK. But don’t believe them. In show biz it’s a matter of fish or cut bait. Increasingly, it’s a part of a symbiotic survival strategy. The reality is that it is prohibitively expensive to develop Broadway shows. Previews have become ever longer to get shows ready for opening night. Regional hits are a logical replacement of the now obsolete system of out of town tryouts. That’s just a reality. "The Jungle Book is not to be for at least several years. According to sources at The Huntington, Disney has packed up most of the scenery in Rochester. it seems that Jungle Book would rival Lion King and take from its Broadway draw. A damn shame."